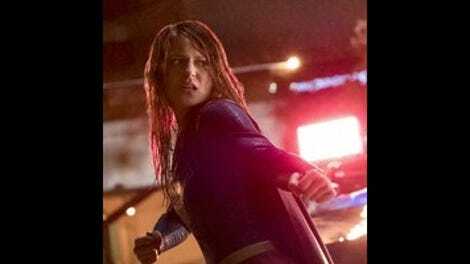 Even more so than the other shows in the Berlanti-verse, Supergirl has a fundamentally high level of difficulty when it comes to depicting its heroine’s powers. Not only does Kara have heat vision, ice breath, super speed, and super strength, flying is her main mode of transportation. Yet though the effects are never going to look as good as they would in a multimillion dollar movie, Supergirl consistently pushes the boundaries of what’s capable on a TV budget. And “Nevertheless, She Persisted” is perhaps the show’s most exhilaratingly action-packed episode to date. Supergirl pulls out all the stops when it comes to its superpowered fights, which are a lot of fun to watch. Unfortunately, the episode surrounding those action sequences isn’t quite as strong as it could be. Unlike last week’s episode, “Resist,” which wove together a whole bunch of the season’s ongoing storylines while maintaining a palpable sense of forward momentum, “Nevertheless, She Persisted” is a tad clunkier. After resolving last week’s cliffhanger and defeating a mind-controlled Clark, Kara decides to take on Rhea in an ancient Daxamite single combat duel. 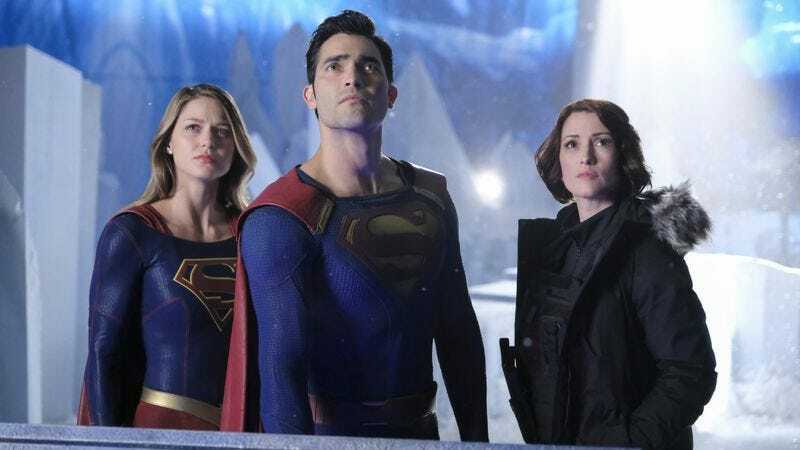 But when Rhea goes back on her word, Kara has to activate a device that will fill the Earth’s atmosphere with lead, making it inhospitable to Daxamites, including Mon-El. The episode’s heart turns out to be the Kara/Mon-El relationship, though it takes about two-thirds of the episode to get there. But if the plot is a little thin, at least the action isn’t. And that kicks off with a great Superman vs. Supergirl fight in which a dose of Silver Kryptonite brainwashes Clark into seeing Kara as his archenemy Zod. Their fight starts on Rhea’s ship before working its way through National City. And while you can sometimes feel the episode working overtime to up the ante (the random explosions in the background were a bit much), the fight is visceral and compelling. And it proves Kara is the strongest hero on Earth as she (barely) beats Clark and flies him to the Fortress Of Solitude where he can sleep off his brainwashing. Clark is delightfully humble in defeat, proudly celebrating Kara as Earth’s champion and effortlessly demonstrating male allyship in the process. And Tyler Hoechlin continues to be every bit as good here as he was in the first two episodes of the season. In the episode’s second set of impressive action scenes, our heroes fight a multi-front war against the Daxamites. Although the Kara/Rhea fight isn’t quite as compelling as the episode’s opening Supes battle, there’s a really cool moment where Kara goes crashing backward through an abandoned building as Rhea charges at her. And there are some nice visual flourishes as Mon-El, J’onn, and Clark take on the Daxamite soldiers with a little help from M’gann and her White Martian army. As CatCo crumbles around her, Cat notes the Daxamite attack is way worse than Myriad. It’s true this episode is more visually exciting than anything the show did in its first season. But it’s the non-action moments the episode struggles to make equally compelling. “Nevertheless, She Persisted” dedicates too much time to the exposition needed to explain the single combat ceremony as well as Lillian Luthor’s atmospheric bomb. Clark and Kara’s visit to Cat’s office is just a thinly veiled excuse to get Hoechlin in the Clark Kent getup for a scene. Alex, Maggie, James, and Lean are largely sidelined. And M’gann’s return is shoehorned in with an odd scene where J’onn mentally connects to her across the solar system. It’s not disastrously plotted, but it’s not Supergirl as its best either. For instance, after Rhea ruthlessly ignores the rules of combat, why do Kara and company remain so committed to the single combat fight? In fact, why have Kara battle Rhea at all if it’s basically irrelevant to the episode’s climax? It’s not until the Kara/Mon-El goodbye scene that “Nevertheless, She Persisted” gets into the kind of emotionally affecting stuff that’s always been Supergirl’s bread and butter. Both Chris Wood and Melissa Benoist (but especially Benoist) are harrowing to watch as Mon-El and Kara handle their goodbye with the selflessness of two true heroes. It speaks well to both of their characters that they don’t hesitate to put the safety of the planet over their own happiness. Even as someone somewhat neutral on their relationship, it’s heart-wrenching for me to watch them say goodbye. Yet I couldn’t help but notice that during their farewell scene, Mon-El is able to thank Kara for making him a better person, an arc the show has charted in great detail this season. She, meanwhile, just thanks him for making her happy. It’s a sweet sentiment, of course, but it also reflects the lack of specificity behind Kara’s arc. The season began with Kara claiming she wanted to find the same confidence in the Kara Danvers side of her life as she gained in the Supergirl side during season one. Yet though her budding journalism career has ostensibly been a through-line, there’s been no real weight or focus behind it. For a while the show pivoted to exploring Kara as a superhero mentor then pivoted again to explore her within a romantic context. And all that shifting has ultimately left Kara feeling underserved by her own show. To put it another way, does the Kara who ends this season feel different from the one who began it? I would argue not really, at least until the final 10 minutes of this episode. After Mon-El’s traumatic departure, Clark, Alex, and Cat each take time to remind Kara just how special she is. And those conversations subtly reposition Kara at a new point in her superhero journey. She’s more bruised by life’s hardships, but also more committed to her desire to do good. She’s faced most of the worst challenges a person can in life, and through it all she’s persisted. Now let’s just hope she gets to persist in a slightly more central way in season three. Some season three setup: Mon-El’s pod gets pulled off course into some kind of wormhole. Also there was another baby that escaped Krypton alongside Kara and Kal. And this one likes blood. It’s official, Cat knows Kara is Supergirl and has just been pretending she doesn’t. After two really strong episodes, James once again gets nothing to do in this finale. One of my biggest hopes for season three is that the show finds a way to re-retool James into a more effective part of the ensemble. J’onn is another character who has felt really underused this season, especially in the latter half. I can’t believe this show killed off Teri Hatcher without giving her a scene with Dean Cain. Come on, Supergirl! We were rooting for you! And that’s it! Thanks for following along with these reviews. If you want to chat more about Supergirl and/or other superhero things during the hiatus, feel free to find me on Twitter. You can start by letting me know whether this Supergirl/Wonder Woman crossover ad is terrible or amazing.